Do we really have to catch 'em all? Levitate Gives full immunity to all Ground-type moves. This Pokemon does not take damage from Ground moves. its body, it is prone to exploding without warning. explode without any warning. Be very careful! cause constant sniffles, coughs and teary eyes. lighter than air, keeping it slight� ly airborne. ous gas, the gas swirling inside it can be seen. results in a terribly powerful poison gas. The higher the temperature, the more gas is concocted by this POK�MON. Emerald Getting up close to a KOFFING will give you a chance to observe, through its thin skin, the toxic gases swirling inside. It blows up at the slightest stimulation. FireRed Its thin, balloon-like body is inflated by horribly toxic gases. It reeks when it is nearby. Leaf Green Because it stores several kinds of toxic gases in its body, it is prone to exploding without warning. Diamond/Pearl Lighter-than-air gases in its body keep it aloft. The gases not only smell, they are also explosive. Platinum Lighter-than-air gases in its body keep it aloft. The gases not only smell, they are also explosive. Heart Gold Its thin, filmy body is filled with gases that cause constant sniffles, coughs and teary eyes. 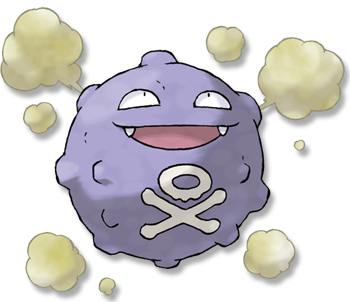 Soul Silver The poisonous gases it contains are a little bit lighter than air, keeping it slightly airborne. Black Lighter-than-air gases in its body keep it aloft. The gases not only smell, they are also explosive. White Lighter-than-air gases in its body keep it aloft. The gases not only smell, they are also explosive.